Teach the find and .forEach commands with this coding concept box! The projects inside this underwater-themed box provide practice using loops and the find and forEach commands. 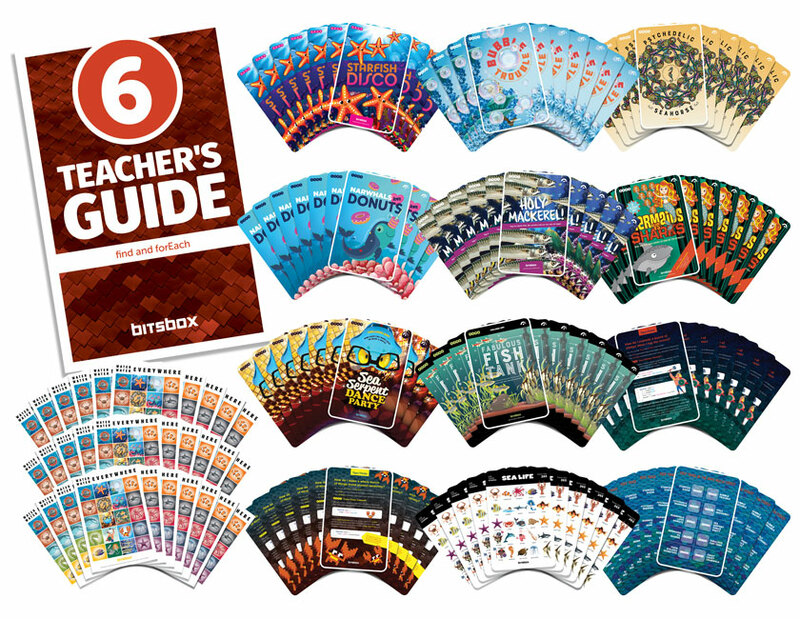 The Teacher’s Guide explains the use of loops and the Bitsbox find and forEach commands. There’s also a glossary for each coding project detailing project complexity, coding concepts included, instructions on how to use the app, suggestions to alter the app, and a URL to see the app in action. Starfish Disco: It's a sea creature soiree! Bubble Trouble: Draw streams of beautiful bubbles that magically pop all at once! Psychedelic Seahorse: This crazy spinning animation is far out, dude. Narwhals Love Donuts: Help your narwhal catch dessert! Holy Mackerel! : Tap to catch fish. Be careful not to run out of taps! Mermaids vs Sharks: What happens when sharks go bowling for mermaids? Sea Serpent Dance Party: Who says you need legs to bust a move? Fabulous Fish Tank: Build your own amazing aquarium! How do I explode a bunch of stamps when I tap the screen? How do I make a whole bunch of things move around randomly?